One Owner Home! One Level in Quiet Gresham Area. One owner home, first time on the market. 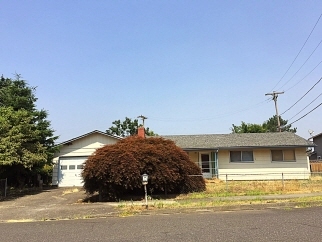 A spacious one level ranch in a quiet area of Gresham on low traffic street. The home needs some updating but has a newer roof. Lots of potential here! 3 bedrooms, living room with wood burning fireplace, dining room with sliders to back patio. Hardwood floors throughout most of home! Kitchen with eat area and door to enclosed patio. One and a half baths. Nice fully fenced yard with a covered, enclosed patio. Plenty of fruit trees including Asian Pears and Kiwi! Oversized double car garage with skylights and shop area. On and off street parking. Exterior Features Fully fenced yard; enclosed back patio; fruit trees. Additional Features and Amenities Oversized garage with shop area. On street and off street parking!